London Days: My CAS loving Heart! Popping in to show you a card I made inspired by a few challenges. I based the lay out on the sketch at Freshly Made Sketches. I knew I wanted to use this sketch and had the idea for this card in my head for a while. I have a few heart stamps and wasn't sure what one to use until I saw the pretty picture at Inspired by All The Little Things-I liked the soft pink and green and the patterns on the cookies. So I went with this heart as I thought the pattern suited the picture. I added the 2 different pinks and a green enamel dot to reflect the colours in the picture. Oh, I love this, Sandie! Fabulous take on the inspiration photo and on the sketch! Simply sweet! Love all the clean space and that heart stamp is utterly gorgeous. Thank you for joining us at The Paper Players this week. Hello, Sandie! Your CAS cards always amaze me! So pretty with these soft colours! Just popping in to thank you for the warm welcome back to my blog! I am doing things differently now and won't be able to visit much but wanted to say hello! Enjoy your evening! This is so sweet...you managed to nail all those challenges with such a clean, crisp little card! Beautifully CAS! Thanks for sharing it with the Players this week! Thank you for joining us at CAS in Friday .. Very pretty and the ultimate CAS creation Sandie! Thanks for joining my challenge over at The Paper Players this week! This is so feminine and cute! The pink and white look fantastic together and I like your design orientation and all the glitter dots! 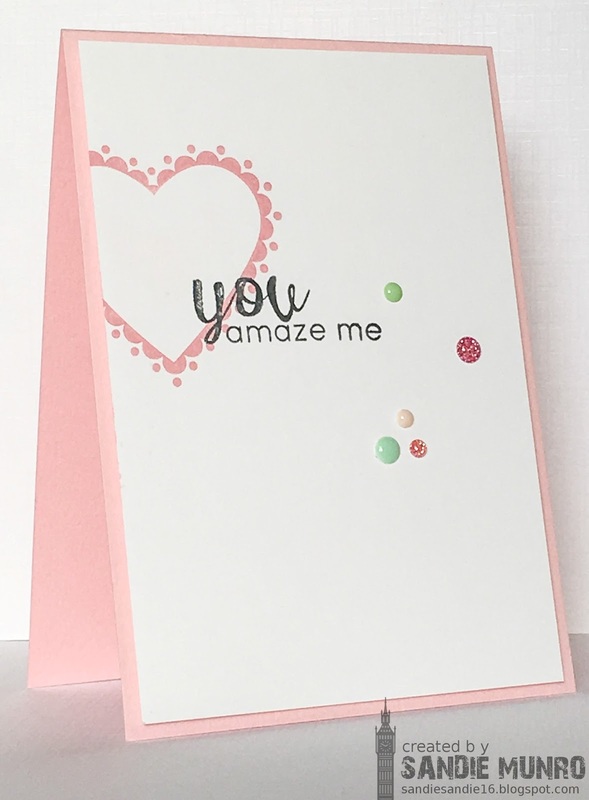 So pretty - I like that you used a pink base - I love the addition of tiny green dots. It's a fab CAs design with a romantic touch. Such a sweet CAS design! Love it! Thanks so much for playing along with us at Inspired By All The Little Things! Very pretty! Thanks for playing at Inspired by all the little Things.